A few years ago, I (Joe Cannon) flipped my marketing class. It went well and I began to research active learning and the flipped classroom to learn how to do it better. After doing all that research, I wanted to share my learning and my experience. So I wrote Flip Your Marketing Class. I am making the book available as a free eBook for anyone interested. To give you a better idea of what the book is about, I briefly describe the chapters below. To get your free PDF copy of the book, email Joe Cannon please put “Flip Your Marketing Class” in the subject line. Chapter 1: What is this book about? This chapter sets the stage, so an interested reader can determine what value the book might offer them, and how it is organized in case they want to focus on select topics. Chapter 2: What is active learning? This chapter provides definitions and explanations of learning, active learning, and passive learning. Chapter 3: What is a flipped classroom? This chapter introduces the flipped classroom. It discusses the costs and benefits of flipping your classroom. Chapter 4: What educational theories and concepts inform the design of a flipped classroom? This chapter provides a selective review of the academic literature on teaching, learning, active learning, and the flipped classroom. It specifically looks at a few relevant theories including Bloom’s Taxonomy, constructivism, and scaffolding. It also looks at the empirical evidence supporting active learning more generally and the flipped classroom model. Chapter 5: How did you flip your classroom? In this chapter, I share my experiences flipping the classroom. I discuss planning for the class and how I implemented the model. I include a variety of tips and tricks that I found helpful. I also offer other options that I considered but did not end up using. Appendices: Here, I provide sample syllabi, in-class activities, teaching notes, and sample PowerPoint slides, and more. 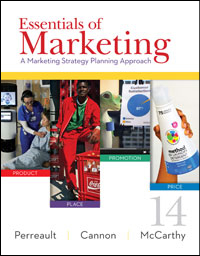 We are excited to announce the publication of the 16th edition of Essentials of Marketing. The new edition features extended coverage of marketing analytics, more active learning supplements, and of course many updates for currency. If you want more information, click through to the book’s information page, check out our emag, contact your McGraw-Hill sales rep or drop Joe Cannon an email. Why aren’t we teaching students how to learn? There is growing evidence about the best ways to learn and how to learn more efficiently. In anticipation of the next revision of Essentials of Marketing and tied to my “flipping the classroom” this semester, I have been looking through some of the academic literature in this area. In that search I came upon a review article “Strengthening the Student Toolbox” (American Educator, Fall 2013 – for a more “academic” treatment of the same research, see Dunlosky et al., 2013, “Improving Students’ Learning Techniques: Promising Directions From Cognitive and Educational Psychology” Psychological Science in the Public Interest) that summarizes the research in this area. I found the paper very interesting — and a pretty straightforward read. The study reviews 10 prominent learning strategies — and identifies which actually work. My fascination brought to me a Coursera MOOC “Learning How to Learn: Powerful mental tools to help you master tough subjects” (taught by Dr. Barbara Oakley and Dr. Terence Sejnowski). It was very insightful and gave me ideas about how I could be a better teacher and a better learner — and how I could help my students to be better and more efficient learners. It came as no surprise to me that practice testing and distributed practice (see the article for a detailed explanation) are clearly the most effective strategies. That adds to growing evidence that tools like McGraw-Hill’s SmartBook and LearnSmart can help students learn better and more efficiently. Full disclosure, my marketing textbooks Basic Marketing and Essentials of Marketing use this adaptive learning technology. The constant testing and adaptive learning help student learn. We have a related post at Learn the 4 Ps which offers some of these tips to students. Have you utilized any adaptive learning technology? Do you have any tricks to implement distributed practice for your students? One of the most exciting additions to the supplements package with our textbooks is the new YouTube PowerPoints. You may have already downloaded the sampler package of these files and our instructions for how they work. You can do all that — and learn more about the new edition — by clicking here. Then, someone told me the Windows versions of these files were not working correctly. I went back and looked at the files — Yikes! my YouTube PowerPoints were not working either. I spent the day researching the problem (I discovered that YouTube seems to have changed soem code — and Microsoft has not yet adapted to this change), and then I recoded the Basic Marketing 19e YouTube PowerPoints, we have fixed the problem. The sampler package (see link below) has also been updated. So if you have already downloaded these — and you were having problems — please try again. If not, give them a shot now. And if you have any problems, please don’t hesitate to e-mail Joe Cannon. Anyone out there interested in the role of technology in teaching marketing and more generally in higher ed? I am very interested in trying to figure out how we can leverage technology to make higher education more effective and efficient. I think that professors need to find a way to get in the middle of this — or many of us are going to be disintermediated. This short article, “How Much Will Technology Really Change Higher Education?” (Good July 30, 2012) is my impetus to see if any like-minded marketing instructors would like to develop some sort of side-bar special interest group on this topic. I personally believe that the answer to the question in the title of the Good article is most surely “a lot.” I think that disruptive innovation in higher ed is inevitable — and I want to be a part of it instead of being left in the dust. I am also a great believer in interacting with others to foster innovation — as is Steven Johnson (see below). Johnson suggests that “chance favors the connected mind.” So let’s connect and increase our odds of creating some breakthrough teaching innovations — for our own students or beyond. So is anyone out there interested in starting some sort of online group that shares ideas on the subjects of higher education, technology and teaching marketing? I leave technology pretty open-ended at this point — online learning, in-classroom technology, homework, flip the classroom, whatever. If you are interested in the topic and want to interact with others with the same interest, send me an e-mail at Joe (dot) Cannon (at) colostate (dot) edu. We could start a mailing list and see where it goes from there. Or maybe you already know about groups dealing with this same issue — can I get involved with your group? Feel free to share this post with like-minded colleagues.